If you've been around me for longer than 5 minutes, you probably know that my favorite time of year is fall, my favorite month is October, and my favorite holiday is Halloween. It started when I was a kid, probably because my birthday is just two days before, and I never really let it go. 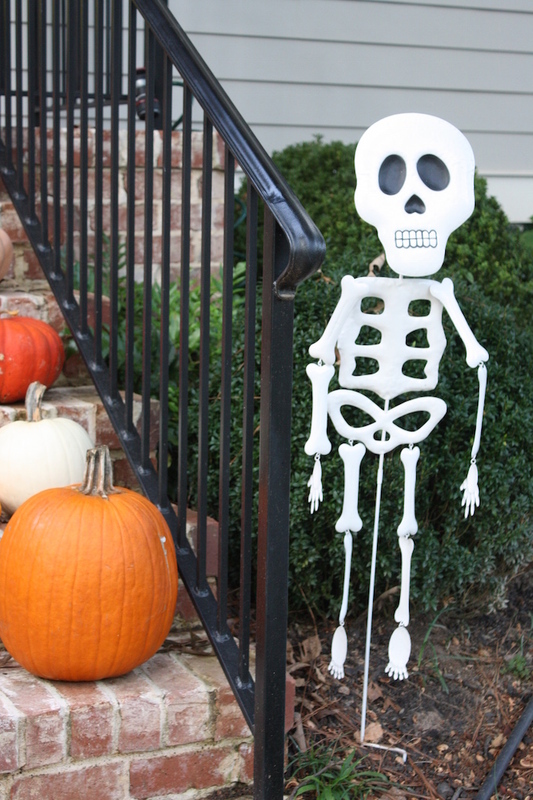 My mom did Halloween decor big in our house - she even hung yards and yards of black trash bags in our garage one year to create a spooky spot for my birthday party. One of my favorite Halloween decorations was an enormous blow-up pumpkin. Not the ones we have now - more like a giant beach ball. This thing had to have been a few feet big, or at least it appeared that way to me when I was under 10. The enormous pumpkin signified that Halloween was officially here. This is the first year that we've really decorated for Halloween, and it's the first year I've allowed myself to buy decor that will be with me for a while versus just for the season. I've been scouring unique spots for home decor since September 1st, and I just wrapped up my purchases this week. My goal was to buy things that would be fun for Halloween, but I could easily shift into Thanksgiving, and I think it worked great! We have truly had so much fun gathering things. Yes, I said "we." Hunter has really enjoyed helping me choose (and hang) things too. He's a trooper. I think I'll keep him! 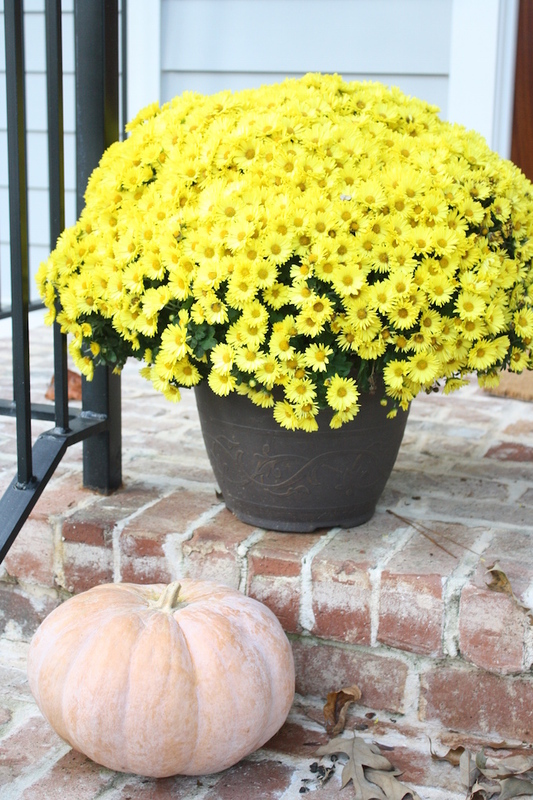 Outside, I chose to go all in with pumpkins of all shades of orange. Orange pumpkins have gotten a bad reputation over the past few years. 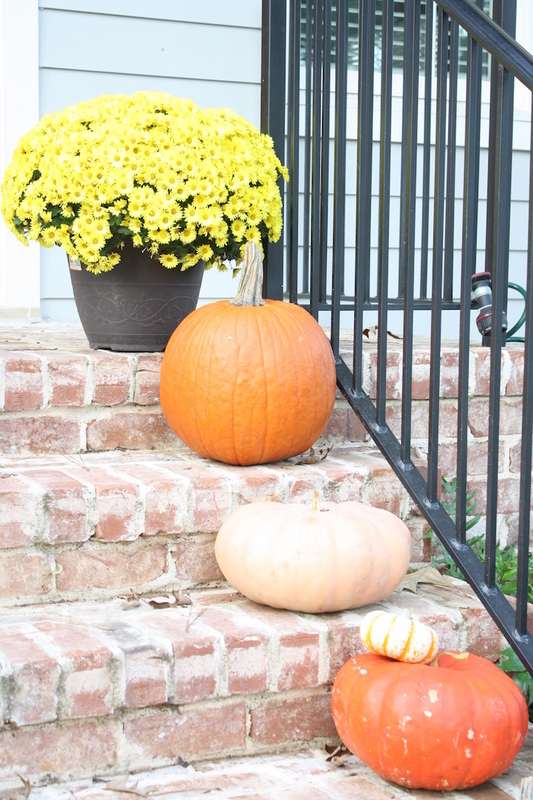 Don't get me wrong, I love a white pumpkin too, but the orange ones look great outside and will look even better once the leaves start to change. We also picked up several cheap spiders from Amazon to hang on the house. I've never done anything like this before, and I think the effect is chic but fun. Tons of neighbors have them, but I was most inspired by Tierney's house (we live in the same hood!). 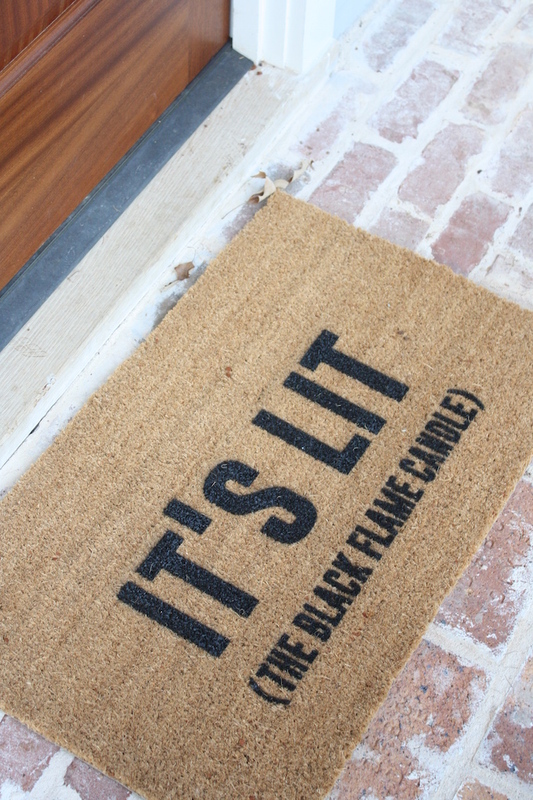 Oh, and I can't forget about the Shop Josie B doormat. If you get the quote, we are BFFs. Inside, it was all about little details. One day I would love to have Halloween art and pillows, too, but we're starting small, y'all. 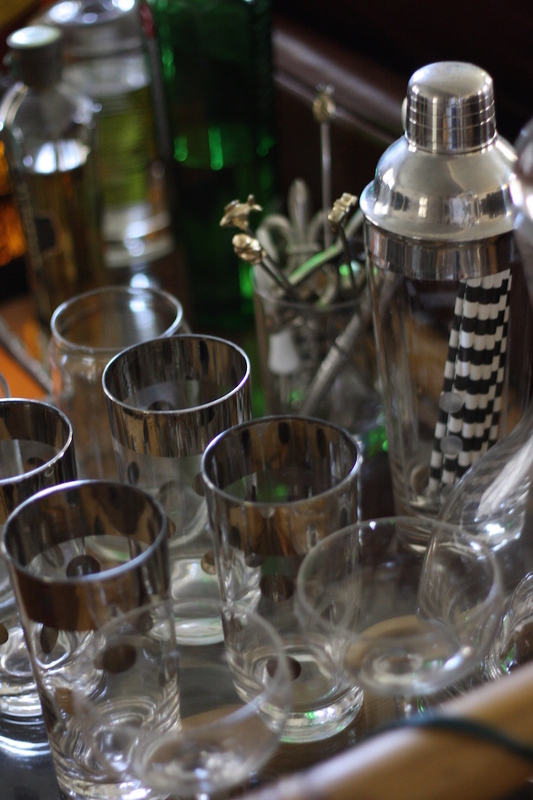 I created little vignettes all around the house which makes every corner interesting and playful. 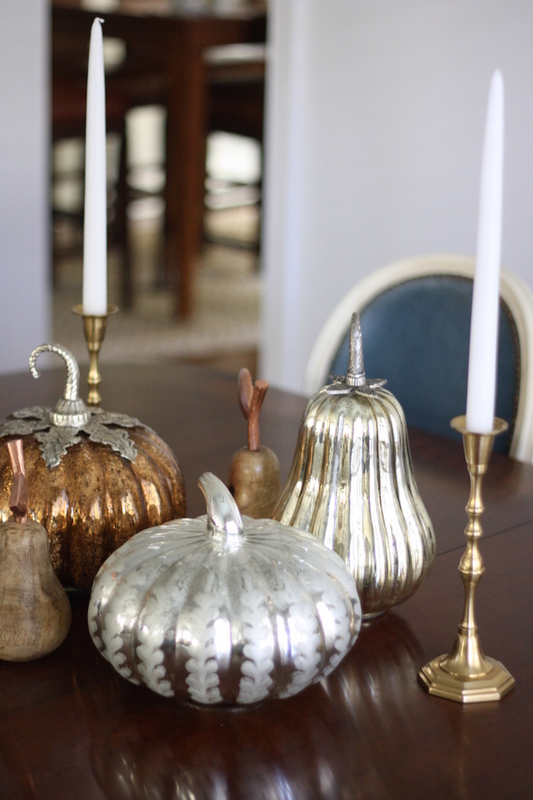 I went to HomeGoods on September 1st (literally) and scooped up several mercury glass pumpkins and gourds and the wooden pears. This set-up on my dining room table will stay until it's time to decorate for Christmas. Well worth the $40! 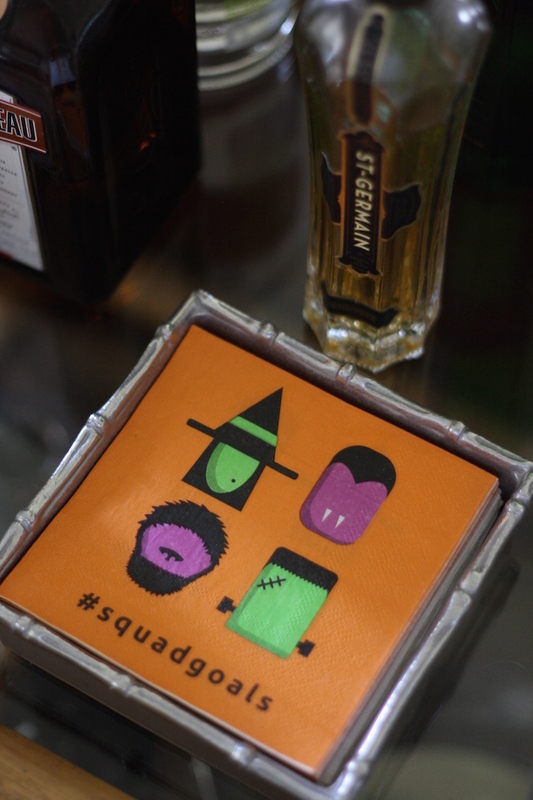 My bar cart got a little Halloween fun, too. I have a cocktail napkin obsession, and when the "Squad" ones from Target run out (gifted by a friend), there are several more styles underneath. All from the Dollar Spot! These three little items might seem like they don't fit with everything else, but they're probably the most meaningful decor items I have. 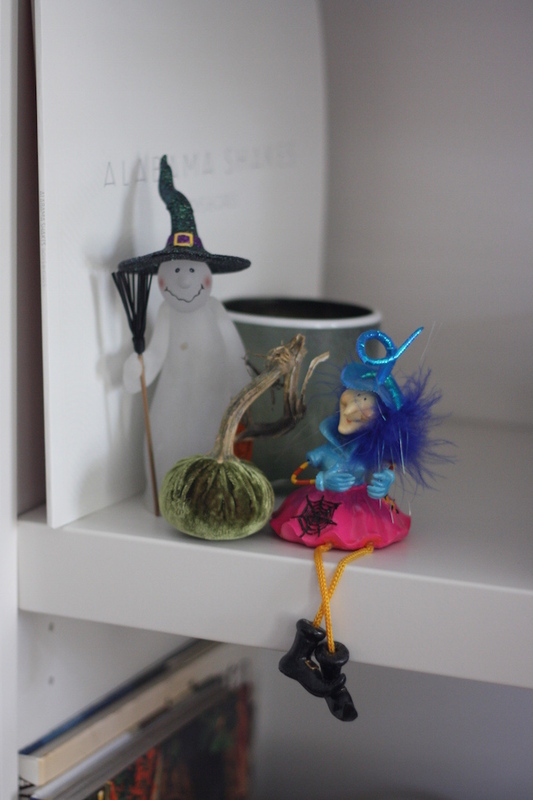 My college roommate's mom gave me the witch ghost (so me), the little plush pumpkin is from my mother in law (she gave me two others, and Ryan ate them both...), and the pink skirted witch with the crazy hair is from my dad. When I was a freshman in college, he had my grandmother go pick up a basket of Halloween snacks and chocolate covered strawberries for me. This witch was in the basket. I still remember my Nana dropping it off for me. 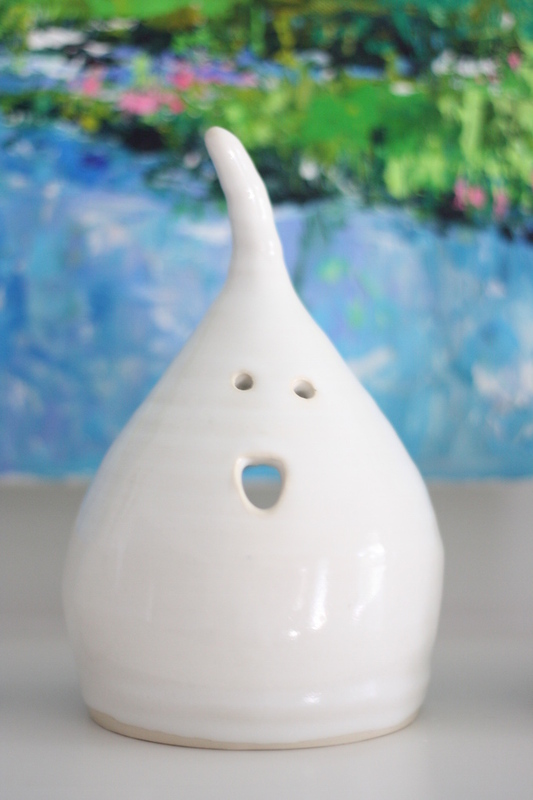 And now for my favorite purchase to date: these hand made tealight ghosts from Mollie Jenkins Pottery. Y'all, I have been stalking Mollie Jenkins' ghosts since this time last year. I think I checked her shop every day in September, and when she updated her shop on Monday, I purchased two sets immediately. They are even better in person than I could have imagined. I hope to add another set or two to my collection. They're just so dang cute! 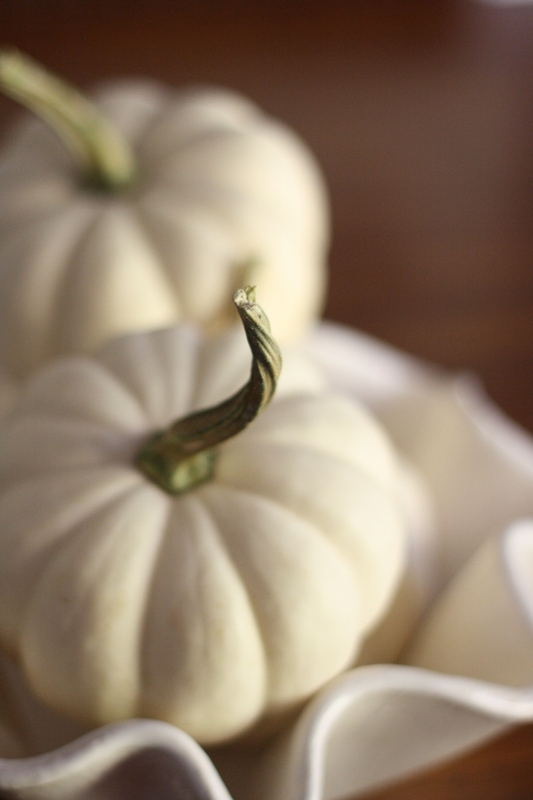 I have a few more little nods to Halloween here and there: pumpkins on our breakfast table, a bat night light in our powder room, a gilded pumpkin on my bedside table. I love it all.